With the release of her new movie, 'Begin Again', it feels like I can't escape Keira Knightley at the moment. Nor do I want to. If I'm completely honest, I felt sorry for her in recent years - the media always seem to be criticising her weight or her infamous pout. She's been on our radar for over a decade now, I think it's time we move on from analysing her slim figure. Ever since her 'Bend it Like Beckham' days, I've been a fan. Her portrayal of two of my favourite literary heroines, Elizabeth Bennett and Anna Karenina, could have been disastrous. But instead, she hit the nail on the head and really got into those character's psyches. As you may have gathered, I've been eagerly awaiting 'Begin Again' for quite some time. I think it's a new direction for Knightley - in recent years she's stuck to more challenging roles. I doubt this movie is a through-and-though chick flick but it definitely appeals to a wider audience. Plus, the film has been directed by John Carney - the man who gave us the wonderful film 'Once'. As 'Begin Again' is now cinemas, I thought I'd devote this week's 'Fashion Inspiration Friday' to the uber-stylish Keira Knightley. As the face of Chanel's 'Coco Mademosielle' for some years now, Knightley has close links with the fashion community. So when she married the 'Klaxons' member, James Righton, in 2013 wearing this sweet yet not so formal Chanel dress, she created a media storm. As she told 'Elle' magazine in their July 2014 issue, 'every time I've worn that dress, I've had a fantastic night, and if you've got a dress where you've always had a fantastic night, it's worth having another fantastic night in it', which is such a nice premise. Although she did wear a second, secret Valentino gown for her official nuptials in the South of France later that year, that dress has never been released for public consumption. I love her first Chanel wedding dress. 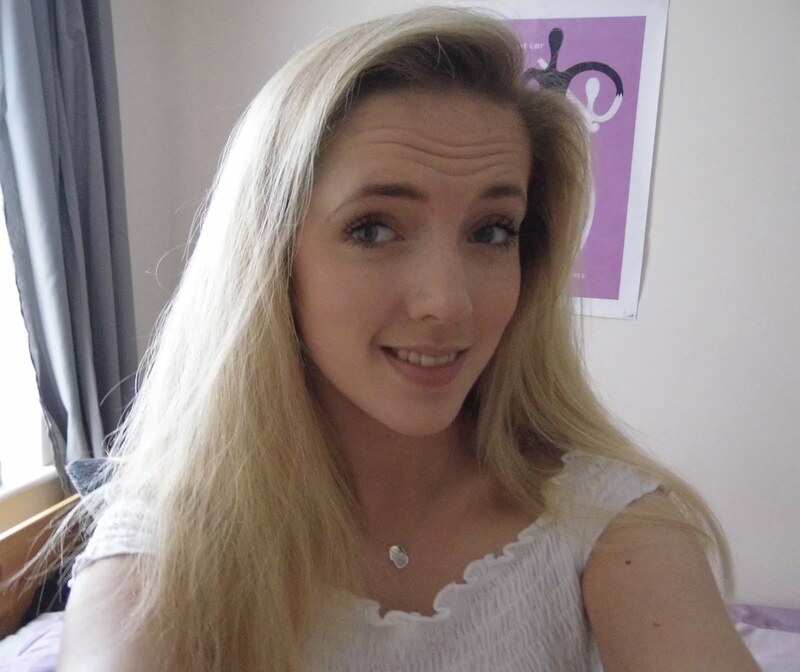 It's fun and flirty but also very classic in its design. Knightley nails bridal chic with a pair of classic 'Ray Ban' wayfavers. At the Chanel AW14 fashion show in March, Knightley was criticised for this nautical/optical illusion dress (above left) - which is so unnecessary. I love this look - it combines the classic nautical-style dress while incorporating the cut-away trend. The square shapes at the top and bottom contrast to this interesting, figuring-hugging optical illusion in the middle. This dress captures Keira's style and absolutely cements her fashion credentials. Similarly, I adore Knightley's everyday street style. 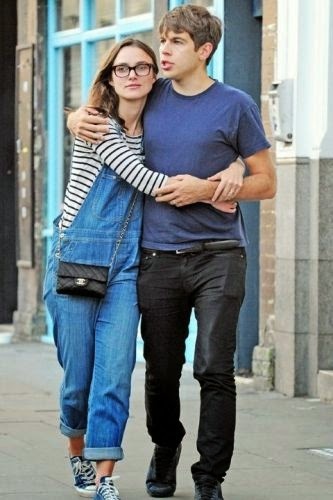 Pictured left with her husband, strolling around London, Knightley gives a nod to the dungaree trend but styles it in her own way. With a simple Breton top, a pair of Converses, and a classic Chanel clutch of course! She's looks comfortable and stylish - ideal for a casual walk round Islington. Knightley's wardrobe in her new movie, 'Begin Again' seems to have really captured the essence of her own personal style. Knightley plays Greta - the ex-girlfriend of a rock star and a struggling musician herself. Throughout the movie's promotional photos, Knightley is dressed in jeans and T-shirts and feminine (yet not overtly girly) dresses. This style really suits Knightley - she's undoubtably very feminine without being sickeningly girly. I think this is why I identify with her and admire her flawless fashion sense. Her style is classic and experimental at times. Like all great fashion girls, she's not afraid to take risks but she knows what suits her. I like that she doesn't seem intimidated by the fashion industry - she can hold her own as a result of her style success. Knightley looks fantastic in 'Begin Again' and above all, I know that I'll get such great style inspiration from this movie.